Dairy free doughnuts! I was so excited to make these! Can you tell?! 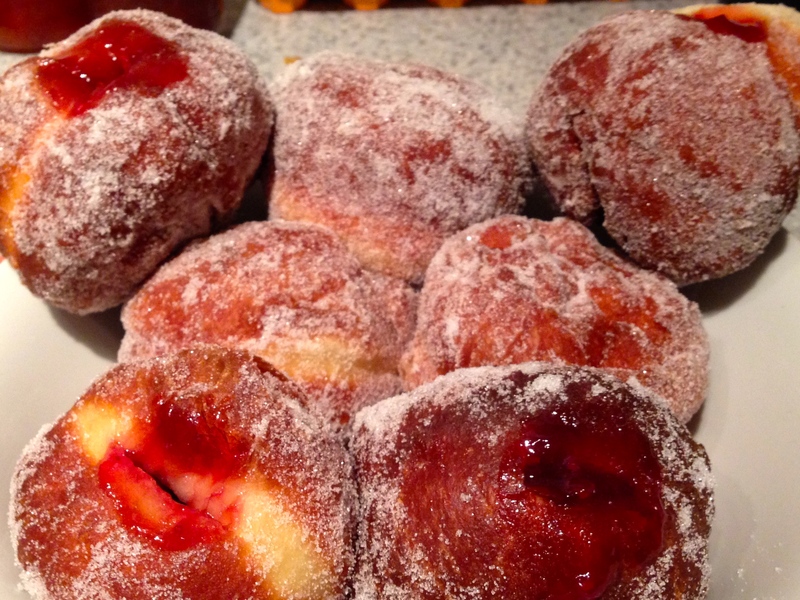 I haven’t had a doughnut in over 5 years – This is something I have not found anywhere dairy free, so imagine how pleased I was when I successfully made them. I always thought they would be extremely difficult to make, very time consuming and fiddly, so I did not bother to look up a recipe. I then stumbled across a recipe for doughnuts in Jamie Magazine and saw that doughnuts did not seem quite as hard as I thought. Sort of like bread with a few extra ingredients, and then fried. So I took the plunge… and it worked! A sweet soft chewy mouthful with a pop of sweet jam in the middle… ideal. The only thing was that my doughnuts were not quite as pretty as those in the picture of the recipe. I’m sure that will come with practice, and, lets face it, thats hardly the most important thing when it comes to doughnuts! I would say these doughnuts are best eaten fresh on the day you make them. If you decide to keep any for the next day, stop after deep fat frying them, and only coat in sugar and fill with jam just before eating. Microwave on high for 15 seconds to heat them up again. Takes 45 minutes, plus 1 hour 30 minutes rising time. 3 tbsp caster sugar, plus extra for coating. Heat the milk to just below boiling point, then add the butter and stir until melted. Add 5 tablespoons of water, turn off the heat and allow the mixture to cool slightly. In a bowl, combine the flour, yeast, salt and sugar. Add the milk mixture and the beaten eggs to the dry ingredients, and stir to make a soft sticky dough. Knead the dough in a mixer for two minutes, or to do this by hand – Turn the dough out onto a lightly floured work surface and knead for about 5 minutes until smooth and elastic. Put the dough in a large lightly oiled bowl covered with clingfilm and leave to rise for about an hour or until doubled in size. Dust a baking sheet with flour. Tip out the risen dough to a lightly floured work surface. Knock the air out of the dough by punching it down and cut the dough into 10 equal pieces (roughly 80g each). Shape the dough into balls by shaping between your hands. Ensure the top and bottom is smooth. Place the balls equally spaced out on the floured baking sheet. Cover loosely with a piece of oiled cling film and leave to rise again for about 30 minutes, or until the dough does not spring back if you lightly poke it. Heat the oil in a large pan to 150C. 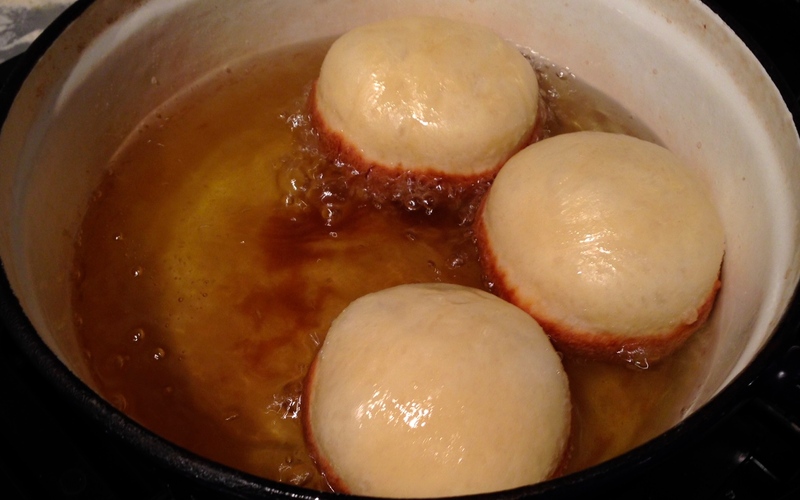 Fry the doughnuts in batches for about 4 minutes on each side until golden brown. Remove from the oil and drain on a double layer of kitchen paper. For any doughnuts you do not plan to eat on the day of making, stop at this step and continue with the steps below only when you plan to eat them. 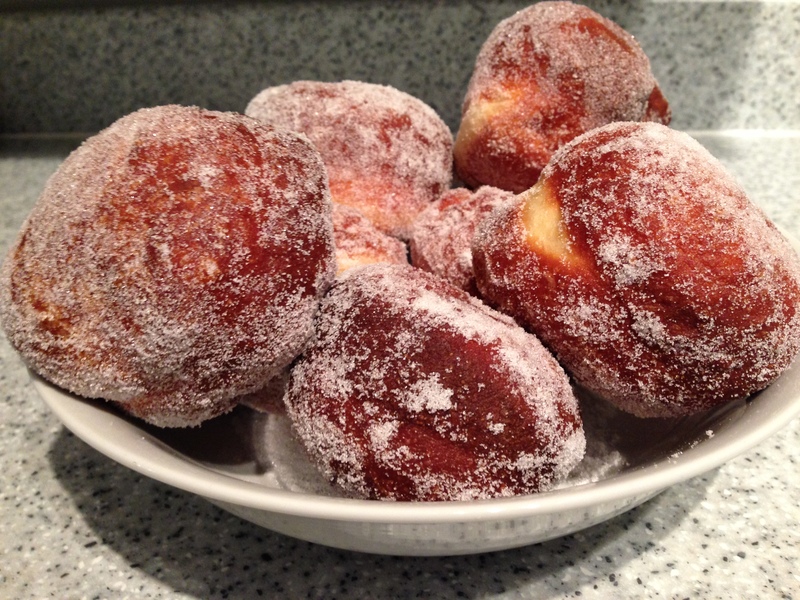 Tip a generous amount of caster sugar in a tray and roll the doughnuts until evenly coated.